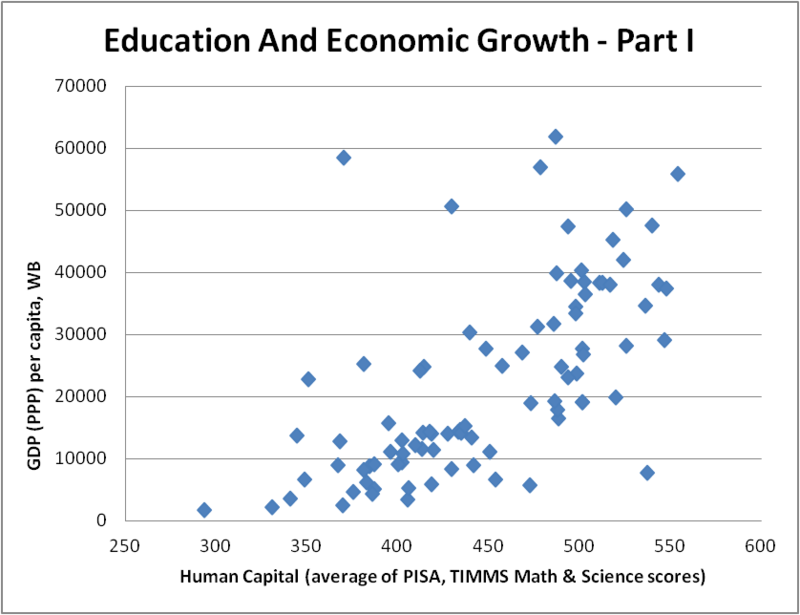 Just in case you thought the correlation between human capital and economic development was an artifice of the post-socialist world, here is a similar graph (R2=0.4273) for all the world’s countries that have participated in the Math and Science portions of the PISA or TIMMS (8th grade) international standardized student assessments. The methodology is the same as described in the previous post. As you can see, the relation is every bit as strong at the global level. However, you may point to a few outliers. How to explain them? Corruption, institutions and “governance”, “ease of business” indicators, etc. are all next to useless; in fact, it has even been found that some corruption is better for growth than no corrupt at all (though there is a critical point of extreme corruption at which it becomes deeply harmful). But these are minor technical discussions. As far as I can see, there are only three major factors that explain why some countries diverge from the close correlation (R2=0.8393) between human capital and economic development observed in normal countries with a long history of capitalist development: (1) Major exporters and mineral exporters, relative to their total GDP; (2) Countries with a legacy of socialism and central planning; and (3) Countries with small populations that are also major financial, tax haven, or tourism centers. As you can see from the graph below, the conventional countries would form a nice best fit exponential curve (R2=0.8393). 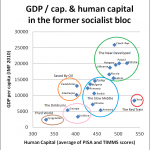 So would the countries with socialist legacies (R2=0.4908), albeit with greater dispersion and at a systemically lower level than the normal capitalist ones – especially once you remove those among them with substantial resource endowments. The same in reverse applies considering those countries that have managed to occupy niches in tourism, providing tax havens, and above all in financial services (R2=0.6014) – they do systemically better than the normal capitalist countries. The only countries to defy this iron correlation between are those whose oil production enables their populations to live off the rents from it (R2=0.0002); but these Rich Oilmen countries are very few in number, and concentrated in the Gulf. The Capitalist Normals (blue) have long histories of capitalist development, and while some – like Australia or Argentina – may have large primary resource endowments, they cannot be said to dominate the economy. They have a very close correlation (at least by social science standards) between levels of human capital and economic development. The developed countries in this band occupy the global technological frontier. As usual, the outliers tend to be exceptions that prove the rule, so I’ll focus on them. Argentina does slightly better than its PISA scores might otherwise indicate, but here there may be a few explanations: (1) Older Argentinians are far better educated than their counterparts in most of the rest of Latin America; (2) Low school-leaver human capital may be in part compensated by having the continent’s highest tertiary enrollment ratio. UPDATE: The Argentina outlier is solved. According to Steve Sailer, Argentina’s low score is thanks to the scrupulousness of its school administrators, who – unlike most other countries – took the effort to track down the truants and drop-outs, who constituted 39% of its school-age population. Without this effect, Argentina’s score would have been about 40 points higher, i.e. above Mexico, and similar to Chile and Bulgaria, that is to say right where it should be. Sailer also makes the observation that since truancy tends to be more prevalent in poorer countries – a factor that is only rare adjusted for in the PISA tests – the gap in the human capital of older schoolchildren between the high-scoring developed world and the low-scoring developing world are, if anything, even higher than recorded in these tests. Syria and Jordan both do a bit worse than their potential. Perhaps the influx of poor Palestinian refugees depresses Jordanian per capita wealth, while Syria is hampered by an extremely statist economy. Israel is a major positive outlier. 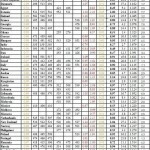 One explanation is that there is a lot of math and scientific aptitude diversity within Israel, with Arabs and Sephardi Jews performing badly and Ashkenazi Jews doing much better and perhaps a great deal of variation within the higher-IQ Ashkenazi group in particular; however, this is not borne out in the statistics, with the standard deviation for Israeli scores no higher than in many other countries. So why is it richer than, say, Turkey? No idea. Maybe because of US financial help, which is not inconsiderable. Maybe because the entrepreneurial Jew stereotype is correct even if the clever Jew stereotype isn’t. Greece is a minor positive outlier, but their debt crisis is cutting it down to where it should be; as with Ireland a few years ago (it used to be an outlier in 2007 but is no longer). I guess the invisible hand has a sense of justice. The United States is the most significant positive outlier, getting almost $10,000 more GDP than would be warranted by its human capital levels, which are comparable to Sweden or Australia. One major factor is surely that Americans simply work much longer than Europeans; their productivity levels, output per hour worked is, in fact, virtually equal to that of Germans or Swedes. It also helps that it has plentiful land per capita with the world’s best natural riverine transport system – and useful land, not permafrost like in much of Russia or Canada – and controls the world’s reserve currency. Korea is a major negative outlier, one of the world’s cleverest countries but one that hasn’t yet even fully caught up with Italy. However its case – as is, to a lesser extent, that of Finland and Taiwan – is explainable by the simple fact that for them, “convergence” isn’t a finished process; they continue to grow relatively rapidly by already-developed country standards, they do not have any debt or fiscal crises, and they can expect to continue moving in the direction of ultra-rich countries like Switzerland and Singapore in the next decades. That said, Japan – also a minor negative outlier – indicates there may be diminishing returns to ever more impressively educated populaces. It is important to emphasize, also, which countries in this category are NOT outliers: Brazil, Mexico (despite a substantial oil endowment), Indonesia, India, and Turkey. Also South Africa, which is not in this database, but can be inferred to have very low human capital based on its still prevalent illiteracy and very low TIMMS (4th grade) results. Now Brazil and India are regarded in the Davos press as superior to Russia, and in the long-term superior to China also (by virtue, so their argue, of their democracy and “demographic dividends”); the other nations cited here have all at one time or another been suggested as replacements for Russia in the BRIC’s. If we are however to regard human capital as the main determinant of the natural level of economic development, and the “potential gap” between the two to be the most reliable determinant of future growth prospects, then the best BRIC by far is China, followed by Russia; to the contrary, India and Brazil (and any prospective BRIC’s members) are unremarkable. The Red Tigers (green) are countries with major legacies of socialism and often central planning. It is interesting to observe that countries where reforms started earlier (e.g. ex-Yugoslavia, East Central Europe) and where markets played a greater role under socialism are much closer to the “equilibrium level” indicated by their levels of human capital. That said, despite their relative affluence, their “potential gaps” are still substantial; for instance, the Czech Republic and Poland have human capital basically equivalent to that of Germany or the US, but are still up to twice as poor in terms of GDP (PPP) per capita. This implies that this group will continue converging to advanced developed countries in the years ahead. China is the mother of all outliers, and no doubt a very significant one – it has 1.3 billion people living at lower middle income levels (although a few provinces remain distinctly Third World) but their high-school students now outperform the US and most of the EU. In my opinion this is the result of a very special situation. The Maoist state suppressed economic growth to a degree unprecedented in virtually any other state in the socialist camp; it also started from a very, very low base. 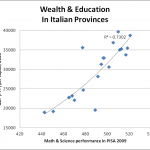 But despite its ruinous economic views, its social policies – including basic education – were implemented far better than in almost any other low income country, and that on top of (a) their reverence for scholarship that only had its equivalent in the Protestant emphasis on literacy and (b) the observed high IQ of Chinese overseas communities which may have a genetic component. This means that when China introduced market reforms, the “potential gap” between its human capital and existing level of economic development was vast to a degree probably unprecedented anywhere else in the world and in all history. Hence thirty years’ worth of 10% GDP growth that shows no sign of stopping (in fact, China’s relative performance exceeds that of any other Asian tiger in their stage of rapid development). And barring a major and unexpected discontinuity is should NOT stop until China reaches the level of per capita wealth Korea, Taiwan, or even Switzerland. One minor caveat is that rapid development means that this “potential gap”, while vast, may no longer be quite as vast as indicated by the graph. Note that according to some estimates, China’s PPP GDP is now larger than America’s, which would give a GDP (PPP) per capita of $10,000-$12,000 or so. Armenia, and to a lesser extent Serbia and Bosnia-Herzegovina, are negative outliers. Their cases are clear; they suffered from destructive wars in the 1990’s, and in Armenia’s case it remains surrounded by neighbors from hell. The ex-Soviet countries without oil, such as Ukraine and Moldova, tend to be deeply negative outliers. One reason is that they reformed slowly (while the Soviet-era system crumbled about them), and late; and have suffered from particularly incompetent and avaricious governance; as I argued in a prior post, Ukraine never left the period of “anarchic stasis” that characterized Russia in the 1990′s. However, Ukraine’s perspectives aren’t looking good, at least in the short-term. Perhaps it’s because corruption, etc. are still so high that – while they normally don’t have much of an effect – reach such critical levels that they significantly stymie growth; an alternate, and more benign, explanation is that Ukraine’s GDP (PPP) is underestimated – it was not adjusted upwards like Russia’s in the recent OECD and World Bank recalculation of relative prices – meaning that Ukrainians already live better than the statistics indicate, their “potential gap” is smaller, and thus understandably there is less room for fast GDP growth. Azerbaijan, Kazakhstan, and Russia are curious creatures in that in their case, the resource windfall boon works against the socialist legacy curse. 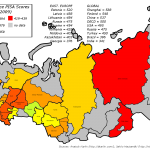 This means that, despite that they are ex-Soviet – i.e., the economy was more deeply distorted and reforms started later than in much of the rest of the socialist camp – they are nonetheless on the upper part of the human capital and economic development curve, along with countries like the Czech Republic or Romania, and are not outliers like Ukraine or even Latvia. At this point I would also like to demolish the myth of Georgia as a shining beacon of unimpeded economic progress in the Caucasus. It will not transform into Switzerland or Singapore, or even Estonia, any time soon, i.e. the next few decades. Its human capital is very low and it is already fairly close to the maximum economic potential enabled by it; this may be an achievement on Saakashvili’s part, who massively – one might say recklessly – liberalized the Georgian economy, which caused (or accompanied) a big growth spurt in the mid to late 2000’s. But it is unsustainable, first because Georgia is now far nearer the limits imposed by its low level of human capital; second, because if anything human capital has declined under Saakashvili (e.g. tertiary enrollment has nearly halved as university fees exploded, making post-school study much less affordable for ordinary Georgians). The Oilmen (red) are those very lucky countries with lots of oil and small populations. It is almost always oil; the sole exception in my sample is Botswana (diamonds and minerals). Unlike either the Capitalist Normals or the Red Tigers, there is no correlation between levels of human capital and economic development among the Oil Guzzlers. That is because the oil production per capita effect, which relies on geological luck of the draw, overpowers all others. That said, they could be divided into a few distinct groupings. (1) The Rich Oilmen. Qatar, Kuwait, and the UAE, and to a lesser extent Saudi Arabia, Bahrain, and Oman, are all fabulously rich thanks almost exclusively to their resource endowments. Their human capital is unimpressive and would not otherwise come anywhere near supporting their oil-enabled luxurious lifestyles. Their attempts at diversification are to be lauded, e.g. finance and tourism in Dubai, or journalism in Qatar, but these efforts are critically reliant on attracting foreign specialists with (oil) money so they are not sustainable. (2) The Casual Oilmen. Norway and Russia benefit greatly from their oil windfalls; for a start, they largely rule out fiscal worries. Benefiting from uninterrupted capitalist development, Norway has transformed itself into one of the world’s wealthiest nations; even if it didn’t have oil, it would still be as rich as Sweden. Russia will probably never reach Norway’s level because the latter has far more oil per capita; nonetheless, it has a decent manufacturing base (e.g. capable of making stuff like GLONASS and advanced fighters) and a moderately growing economy that has no reason not to converge to Italy by 2020 and perhaps Sweden by 2025 or 2030. Tight supply and growing demand means that it is very unlikely that oil prices will fall and remain low in the foreseeable future, but even on the off chance that they do, Sergey Zhuravlev has calculated that the effects on Russia’s economy are going to be modest in the medium-term and negligible in the long-term. (3) The Poor Oilmen. Oil is likewise of help for plugging budget holes to Algeria, Kazakhstan, Iran, Venezuela, Mexico, and Azerbaijan. However, unlike the case for the Rich Oilmen, their populations are too numerous to live off in sumptuous comfort off the rents; oil production per capita is too low. This means they can’t fly off into the stratosphere like the Rich Oilmen. They need non-oil based growth to become rich. But unlike the Casual Oilmen they are unlikely to achieve much of that because their human capital levels are very modest. If there is an oil crash, past experience – e.g., Venezuela in the 1980’s and 1990’s – suggests that they will be in for many years of stagnation and fiscal crises. The Bankster Nations (crosses) tend to be small countries which have managed to become major financial, tax haven, or tourism centers. Their GDP (PPP) per capita tends to be higher than the level suggested by their human capital, but not to anywhere near the same extent as the Rich Oilmen. Liechtenstein is the biggest outlier in my database; its human capital is respectable, but its GDP (PPP) per capita at $141,000 is literally off the chart. No wonder when their population is a mere 30,000 souls. Luxembourg, Singapore, and Hong Kong have all carved themselves out very profitable niches as financial centers serving neighboring economies that are much bigger but also more regulated. Macao is Asia’s gambling center (and unofficial a conduit for Chinese money laundering). Cyprus serves a similar money laundering and reinvestment function for Russian nouveux riches, to the extent that the Russian government recently bailed out the island. Mauritius is a tax haven, and is also – along with Malta and Trinidad & Tobago – a popular vacation spot. Switzerland is an entire nation that has devoted itself to financial services (including the more shady, secretive ones) as well as other very high added-value stuff like precision engineering and pharmaceuticals. And it has become extremely rich. Without exception all these places are doing better or far better than the average Capitalist Normal country. 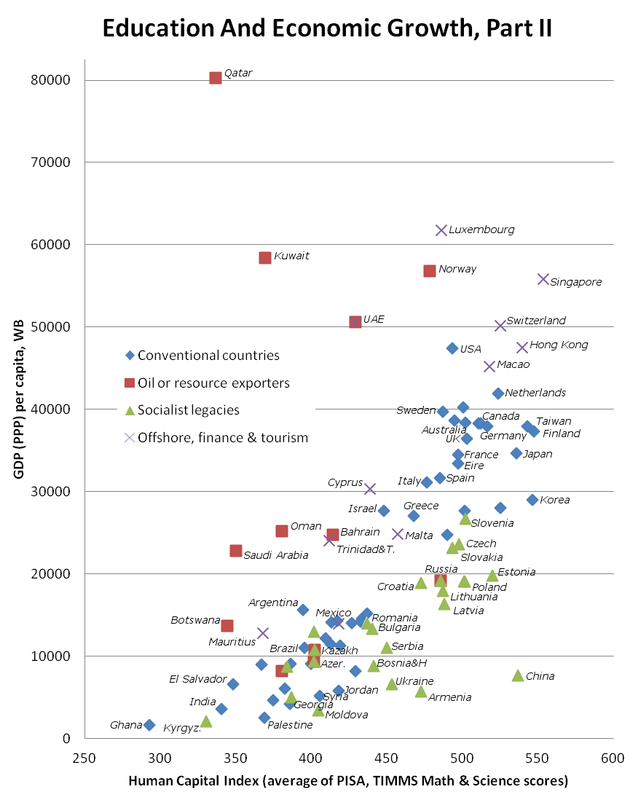 That said, even here there is a definite correlation between human capital and GDP (PPP) per capita. These activities may require less hard work and scruples than is typical for other industries but they still require brains – especially for the high-end finance stuff. Not so surprising then that it is the highest human capital countries like Singapore, Hong Kong, and Switzerland that have become so prominent in it.